The battle at Cedar Mountain, Aug. 9th, 1862. Charge of Crawford's Brigade on the right. Troop and Road Positions are Approximate. Current roads are numbered. New roads are marked in red. Locations of the photographs, not the direction of the photographs, are marked with circled red letters. The corresponding letter at each of the photographs in this section refers to this map. 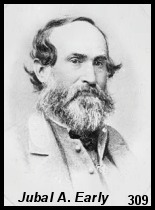 In 1862, after Union troops were driven away from the Confederate capital in the Seven Days battles, the Lincoln Administration turned to Major General John Pope. Pope forged an army out of the several Union commands defeated by Stonewall Jackson in the Valley and christened the new fighting force the Army of Virginia . 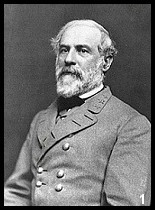 Concerned by Pope's move to Culpeper Court House and his proclamations against Southern civilians, Robert E. Lee quickly dispatched Stonewall Jackson to Gordonsville with the order: "I want Pope to be suppressed." Outnumbered by Pope's forces, Jackson looked for an opportunity to strike. Pope unwittingly divided his army along the Rapidan River. Jackson then advanced hoping to isolate a portion of Pope's army near Culpeper. Although he had been reinforced by Major General A.P. Hill's large "Light Division ," Jackson was hampered by poor roads and problematic orders. Jackson vented his frustrations on A.P. Hill, sparking the most celebrated feud in the history of Lee's lieutenants. Pressing forward towards Culpeper on August 9, 1862, Jackson's troops encountered Union cavalry blocking the road near Cedar Run. 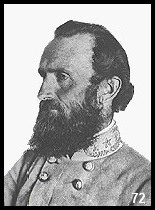 Confederate Brigadier General Jubal A. Early formed a line of infantry and artillery perpendicular to the road with the right of the Southern line anchored on the shoulder of Cedar (or Slaughter's) Mountain.